Pucallpa Peru Boas are my favorite Red Tailed Boas. 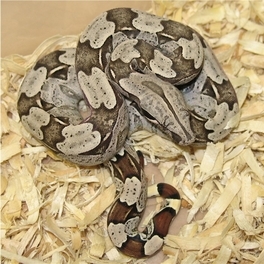 I think I like them best because they were some of the first True Red Tailed Boas that I had seen as a kid. I remember seeing Boas that a Missionary had brought back from Peru in the mid eighties. 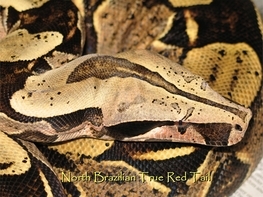 These Boas were beautifull with nice red tails & a Yellow Back ground color. The Pucallpas I have in my collection derived from those exact Boas & were produced by my buddy Gus Rentfro. His line is the best in the Country & goes way back to those outstanding Boas that were brought to the U.S. by that Missionery so many years ago. 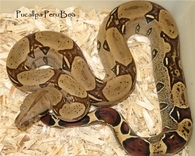 I also have a New Bloodline that derived from a small group of wild caught Peru Boas from Pucallpa in 2009. This small shipment was the first of its kind in over 20 years & I was fortunate enough to obtain a few beautifull boas from this shipment to add some new bloos to my exhisting colony. Pics of both types are below. 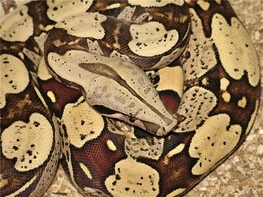 Boas with provenance to Brazil are quite rare in captivity today. This is due to the fact that the export of Boas from Brazil has been a rare occurrence in the past and Brazil has been shut down to export of CITES animals since the late eighties. 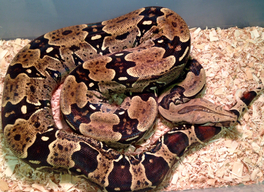 The Boas I have here originated from Two Sources - One is my friend Eugene Bessette of Ophiological Services. He purchased his adults in the late eighties which had provenance to North Brazil & entered the U.S. under CITES in the early eighties. The Other are from the Late Loyd Lemke - a well known Breeder & importer that received a few small shipments of Brazil Boas in the Eighties. 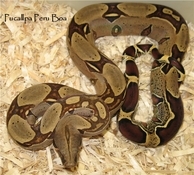 Both types are are unique Red tailed Boas with a beautiful yellow back ground color as adults. They also do not get very large & my average adult size is around 6 feet. A very under rated boa because they take a few years to get their beautiful adult colors. Update 2018 - I have a very small number of some Lemke Brazil Boas available. Suriname is a large country located on the North East Coast of South America. It is sandwiched between Guyana to its west & French Guiana to its East and Brazil to its South. 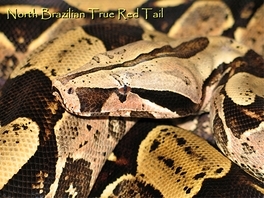 The epitome of the True Red tailed boa and to some the Holy Grail of all boas, the Surinam boas has almost a cult like following amongst admires. I have two distinct Bloodlines Of Surinam. 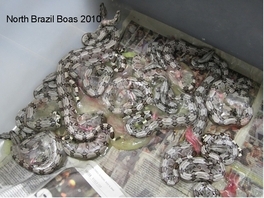 The Surinam Boas that I have are direct imports from Surinam that arrived here in the U.S. back in 1995 under CITES. They are beautiful dark red tailed Boas with a dark chocolate brown back ground color & connected saddles. The head spears are quite prominent & they exhibit beautiful eye lash markings.